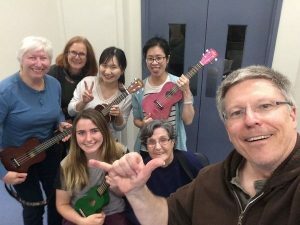 Start Your Ukulele Journey in 2019! 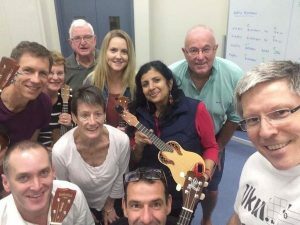 Each class is 2-hours per week, from 7pm – 9pm, held at Dougherty Centre, 7 Victor Street, Chatswood. Park here or in Westfield carpark, or catch a train as we are 2 mins from the station. See our pages on Meetup.com for more information and to book. 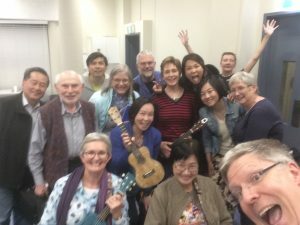 Starting at the very beginning, learn a bit of history, ukuleles sizes, how to hold, how to sit/stand, names of strings, proper strumming technique using both thumb and fingers. Basic finger picking, and basic strumming patterns (more than 30). Enough chord shapes to be able to play literally 1000s of songs. Over a dozen songs in detail in the repertoire, including lullabies, pop songs, standards and a couple of songs of your choosing (if technically possible). Practice tips, care and maintenance. 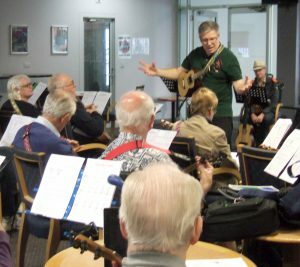 Focus for the Intermediate course is expanding the use of scales, learning some new picking techniques, and using several chord melodies to pull it together with some more advanced strumming. Learning Outcomes: Better understanding of how scales make up melodies. Improve dexterity of fingers by learning new picking patterns and scales, increase chord repertoire, and increase strumming patterns. 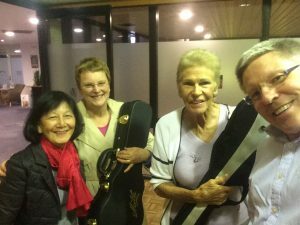 Pre-requisite – bring your own ukulele, if possible. 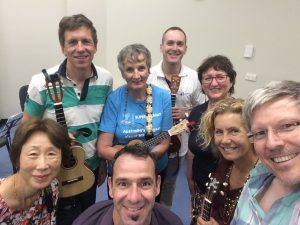 Loan ukes are available but need to be booked in advance. All material works for soprano, concert and tenor ukulele. 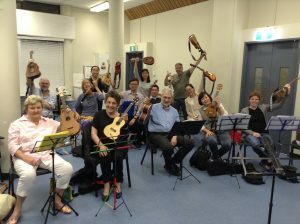 This course does not suit baritone ukulele. 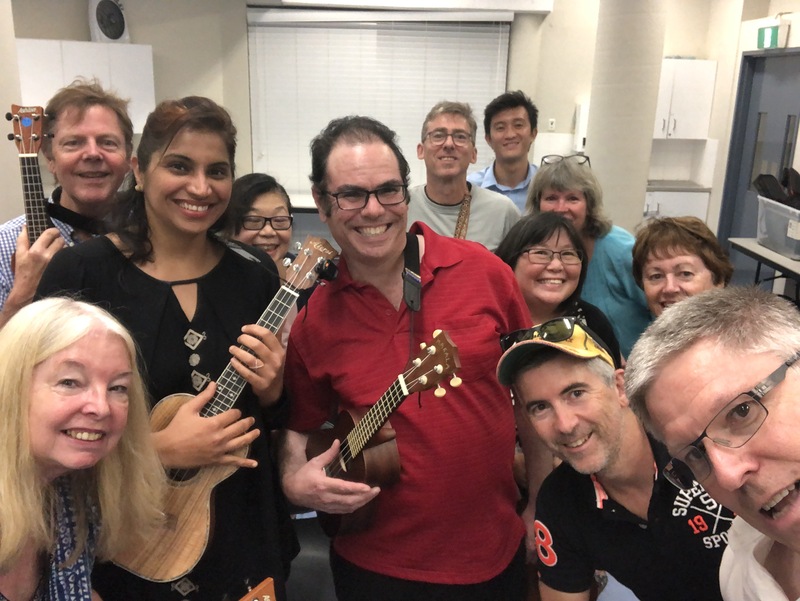 We recommend you try Big Music (Crows Nest), Turramurra Music, Mall Music (Macquarie) or Guitar Factory (Gladesville) to buy your ukulele – spend as much as you can afford and try to ensure they sell you one that will stay in tune! Reading music is not essential, but is an advantage. 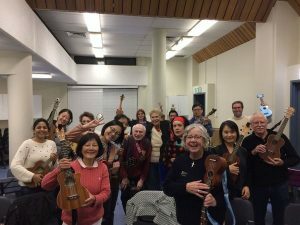 Although this course doesn’t require any traditional note reading skills (unlike the evening beginners’ courses), it will require a desire to learn chord patterns, some gross motor skill coordination, and involve a bit of practice between classes. Singing is not essential, but highly encouraged – even ‘shower-singing’. We cover a lot! Be prepared. You get stacks of hand-outs covering technique, chords and repertoire. Each week a short video recap is posted to a private video list so you can follow along with the material in the comfort of your own home. 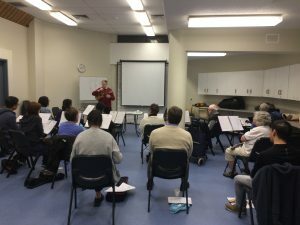 Ian Porter is a Sydney-based community musican who brings the social joys and technical skills of music to a broad audience. 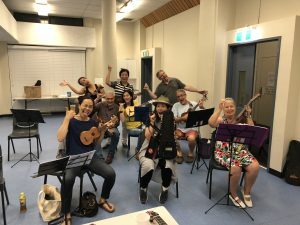 Using the ukulele and voice as tools, Ian leverages off his love of music and earlier study at the Sydney Conservatorium of Music to bring out the inner musician in all his students. 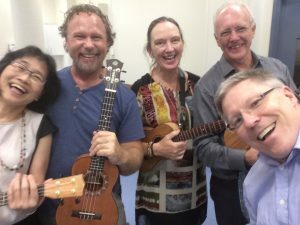 He is also a certified James Hill Ukulele Initiative teacher, Secretary of the Australian Ukulele Teachers and Leaders Association Inc. and Director of The Outlaws Big Ukulele Band. 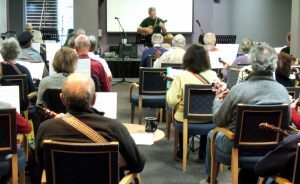 In 2017 Ian started the community pub-choir SixtyMinuteSingers.